You can add new users to your account from the Admin section. Users can be added individually or you have the option to import your users. 1. From the Admin section, by default, you are already in the Users area. 2. Click the New User button. 3. On the Details tab fill out the user information. You will need to have already set up your Departments, Policies, Approval Flows and User Groups to apply them at this stage but this may be done at a later date too. 4. The Reference field is where you can input the reference your user is set up with in your accountancy package. This usually helps to identify the user when exporting the expenses. 5. 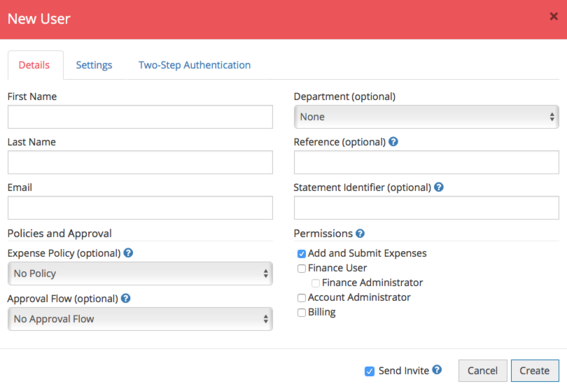 The Statement Identifier is used to match expenses to the correct user when importing multi-user company card statements into ExpenseIn. The Statement Identifier is usually the account name or reference as it appears on the statement. 6. Tick the access Permissions that you wish this user to have. Hover over the question mark icon to get more information on the different permissions. 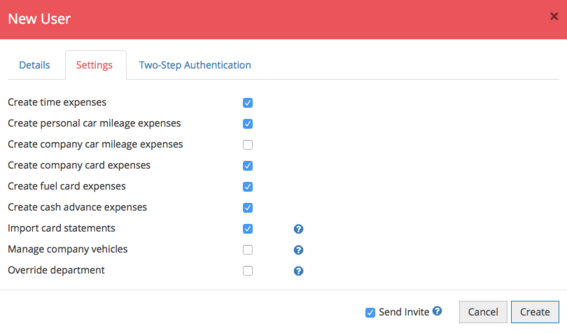 On the Settings tab, you can select the types of expenses the user can create as well as other configurations for that user. 8. If you would like to send this user their invite to use the account, ensure that the Send Invite box is ticked. Alternatively, you may want to set up the majority of the configuration on your account before you send the user invites. You can enable Two-Step Authentication on your user's account. Enabling this will mean that your users have to add a verification code each time they sign into their account. Once you're happy, click Create to add that user to your account. If you haven't already, set up your Departments, Policies, Approval Flows and User Groups and then assign these to your users. You can change your default user settings from the Advanced Settings menu. This will not affect current users but will apply user settings to any future users.